While generally associated with the backwoods whiskey still, the thump keg, or “doubler”, is a very old design element that probably arrived with the early settlers and was incorporated into the stills they built on arriving in North America (Fig. 1). Indeed, some older European stills made use of what appears to be chambers that functioned as thump kegs, so the principle was surely well known to colonists from the British Isles and the continent. The thump keg is one of the most clever and iconic design elements of the traditional hillbilly still whose purpose, briefly stated, is to distill the output of the pot still a second time, without actually having to run the distillate through the still twice. 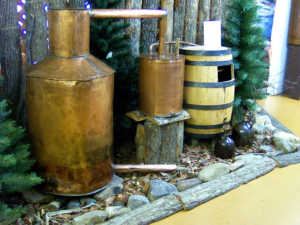 Figure 1, Typical backwoods whiskey still. Smaller copper pot in center is thump keg. An ordinary pot still, without a thump keg, is capable of distilling a wash to only a “low wine”, which will be about 40-50% alcohol. A second, or even a third, distillation is needed to achieve the high alcohol content necessary to make high-proof whiskey or other spirit. Most European distillers still use swan-neck pot stills, and will have both a “beer stripper” to distill the wash to the low-wine state, and a second “spirit still” to rectify the low wine to a high-proof spirit. In the hillbilly still, the thump keg serves the same purpose as this second, spirit still. The thump keg, moreover, does this in a very clever manner, utilizing waste heat from the still pot for its function. Many shiners in fact prefer to use a wooden barrel for the thump keg, precisely because it loses less of this useful heat than would a metal one. As the hot vapor comes out of the still (Fig. 3), it exits the arm into the low wine that condenses in the bottom of the thump keg – indeed, it’s the thumping sound of the the vapor and condensed low wine (and not, as some sources assert, “bits of mash”) periodically erupting out of this pipe that creates the characteristic bumping noise giving this piece of equipment its name. This hot vapor continuously heats the low wine to the boiling point of alcohol, thus distilling it a second time, and producing a much higher-proof product than could otherwise be obtained in a single run through a pot still. While offering obvious advantages over a simple pot still, how does the the thump keg compare to a more sophisticated reflux column still? For the backwoods moonshiner, of course, there’s the obvious advantage of material-on-hand. It’s much easier – and cheaper – to find a discarded wooden barrel than to purchase enough Raschig rings or copper scouring pads to fill a large fractionating column. On the other hand, a well-constructed column is capable of yielding near the theoretical maximum alcohol content, in excess of 95%, while also giving better separation between the ethyl alcohol and the esters and ketones in the heads or the heavy fusel alcohols in the tails. Some, including traditional moonshiners and the connoisseurs of single-malt, pot-distilled Scotch whiskeys, would probably argue that this separation is a bit too good, and that the column strips out too many of these tasty (in moderation!) cogeners, producing a bland, albeit strong, whiskey. 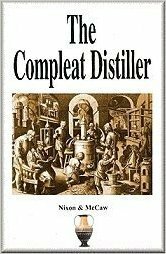 They would maintain that properly-managed pot still set up with a thump keg can deliver just the right amount of these compounds to create a full-flavored, robust whiskey that indeed tastes like whiskey, rather than like an aged vodka. To what extent this is true and how much is folklore is debatable, but it is inarguably the case that the flavor-changes between cuts will less sharply pronounced and that more of these “whiskey” flavors will be present in the final product. In the Discovery Channel series, “Moonshiners”, former shiner Tim Smith maintains that his old family recipe, made in a modern distillery and distilled using a column still just doesn’t taste the same, and even invests several thousand dollars to install a high-tech thump keg to replace the fractionating column. However, if getting these traditional flavors in one’s own distillate is a concern to the user of an efficient fractionating-column still, by simply reducing the amount of reflux in his column, he can obtain results similar to those one would get using the pot still/thump keg setup. Finally, it should be added that a thump keg can be used to impart flavor in another manner as well: it can be used just like a gin basket. Fruit, herbs, or spices can be placed in the thumper where their essences are, in effect, steam-extracted along with the alcohol during this virtual second distillation. This will provide a fresher, fuller flavor than will simply adding these materials to the mash, since more of the volatile flavoring compounds will be carried over into the final distillate. Here’s a video I found on Youtube that demonstrates a traditional copper pot still, thumper and worm set up. If you have any questions about thumpers please feel free to ask in the comments section below and don’t forget to like us on Facebook and Instagram! 17 Responses to "The Thumper Keg Explained – What it does and how it does it!" Wondering what experience is out there on jacketed condensers. the liebig style, I have a thing with sanitary so prefer stainless steel. if one were to use 1/2in diameter ss tube at .065in. wall thickness 36in. long with a jacket of 30in. long of 1in. diameter. I know that SS isn’t that good of a hot/cold conductor but find it easier to clean and non oxidizing when sitting around, unlike copper. I also know if a person were to use a thinner wall thickness like .040in. heat would probably transfer easier but would be harder to tig weld. So what are any ones views on this? Oh yea can the condenser be too long? Note that the conductivity of stainless steel is only about one-tenth that of copper, so all other factors being equal, the stainless cooling coil should, in principle, need to be ten times longer than the copper coil! I can think of no reason, other than budget, why a cooling coil could be “too” long. A longer coil will make for more efficient use of the water going through it and will be able to handle higher vapor volumes. That’s a great question, and not one that’s easy to answer with a simple reply. Several factors come into play here. At a very minimum, you want the liquid deep enough to immerse the end of the downtube a few inches. Deeper immersion will catch more of the vapor for redistillation, instead of just sending it through with no enrichment. On the other hand, a smaller volume will take less time to heat up and will waste less alcohol that remains behind in the thumper liquid. It therefore seems to me that a taller, narrower thumper should work better than a shorter, wider one. Such a design would maximize immersion while keeping the volume low. The rule of thumb is that you want a thump keg that will hold at least twice the volume of distillate that you expect to collect. The liquid volume it contains should begin with around 1/3 the volume of the distillate. 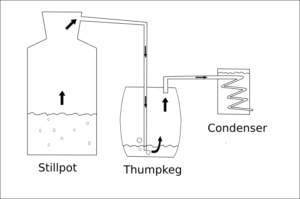 Although the thumper fluid you start with can be just pure water, if it’s enriched with alcohol – a good use for the tails from your previous distillation – the system will not have to equilibrate first (that is, bring the alcohol content in the thumper up to the level of the wash) and alcohol will begin flowing much sooner. It’s said that adding the tails to the thumper fluid also enhances the flavor of the product. One additional comment about thump kegs, particularly as how they compare to column stills. Because the vapor from the still pot exits under the surface of the thumpkeg liquid, this creates a backpressure that increases the danger of vapor leaks in the system. The deeper the downtube sits in the thumpkeg liquid, the higher this pressure will be. Column stills, in contrast, are normally open to the atmosphere at the collection outlet and operate at little or no pressure. In this regard, it makes them a bit safer to use. That’s an interesting point, and would certainly eliminate the danger of overpressure causing catastrophic failure, but my feeling is that it falls a bit short of being the perfect solution. More commonly, pressure, even that way below levels that could cause structural failure, causes leaks in the system that lead to loss of product and can initiate fires or even vapor explosions. For safety’s sake, a pressure relief valve would need to be vented at some safe distance away from the still itself. However, this doesn’t address the loss-of-product issue; it only moves the leak to a safe distance. Nevertheless, a pressure-relief valve is a good idea, and if properly set up, does provide protection against catastrophic failure. Even so, the pressure in the stillpot needs to be kept within safe levels. If it begins to rise for any reason, the distiller needs to back off on the heat quickly. Keeping the liquid level fairly low in the thump keg also lowers still pressure. Each inch that the downtube is immersed in the liquid increases the pressure by about .04 lbs/sq inch (.0025 atm.) so a large still setup with 2 feet of liquid in the thump keg would operate at nearly 1 pound of pressure. On a still 36″ in diameter, this creates a force of more than a thousand pounds pressing on the cape and bottom! As I mentioned in reply to a previous post, “the rule of thumb is that you want a thump keg that will hold at least twice the volume of distillate that you expect to collect”, so in your case that would be around 15 gallons. The usual recommendation is to start it 1/3 full and preferably containing any feints you may need to re-distilled. If you don’t have any feints, but have to use pure water, a somewhat smaller volume may be in order, since it’ll both saturate with alcohol sooner and heat up more quickly, so you’ll start getting your alcohol coming out in a shorter time. As to depth, I’d put the outlet tube as deep as possible without it touching the bottom. This will maximize the vapor-liquid contact as the bubbles rise towards the surface. With a setup of your size, you probably don’t have to worry too much about excessive backpressure from having a downtube extending too deeply into the thumpkeg liquid. What would happen, if I run a corn mesh through the pot still. To the thumper keg. With another fruit ( brandi) mesh. How will that effect the flavor. Or the turn out of the flavor? There’s no reason why fruit can’t be added to the mash either before or after fermentation – or even placed in the thumper keg to add fruit essence to the moonshine. I’ve made plenty of corn mash, and I’ve made fruit brandy; while I’ve never mixed them, it’s logical that if two kinds of mash both make a tasty liquor when distilled separately, they should make a tasty liquor if distilled together. Experimentation is a large part of the fun of the hobby! The one bit of advice I’d offer is to filter the mash before you distill it. If boiled, the grain hulls can give the distillate an unpleasant sulfurous taste, and the pits of some fruits actually contain a cyanide compound that can get into the product. On a 30gal pot 3.5 gal thumper and 3.5 worm how deep does the tube need to be in the liquid in the thumper. And what sugar to water ratio do you recommend when mixing the mash. I’m not sure how to ask this, if I can explain my thought. I use a 5gal copper pot still with no thumper and I’m still new at this so I find myself making cuts mostly by temp until I gain enough experience to make them by taste/smell ect… So right now I’m discarding my foreshots up to about 174-175degF. If I add a thumper does that number change? Will it re-condense in the thumper and would I need a second temp indication downstream of the thumper? And I guess it would be the same for any of the cuts. I do understand I just need to learn how to do it without relying on a temp gauge but it’s just something I was wondering about. Also, how much of the flavor do you loose using a thumper? While I would like a higher proof I do like a good flavor and am probably willing to give up a little abv for a good taste. Without a thumper (or fractionating column, which is what I use), the cut points are going to be poorly defined, with the heads and tails overlapping into the midrun to a large extent. This will make separating the cuts by taste more difficult. What you can do in this case is make a late heads cut (when the banana-acetone taste is nearly gone) and an early tails cut (as soon as the midrun starts tasting even a little bit bitter and unpleasant), but save these heads and tails (collectively called ‘feints’) from each of the distillations and then run them through a second time, with the next batch (see below). Furthermore, the proof of the midrun is going to be rather low with a simple pot still. With a pot still and no thumper or column, it’s usually necessary to distill twice to get the proof up to a respectable level. While most American commercial distillers use fractionating columns to accomplish this end, the Irish and Scotch distillers still use pot stills and distill their product two or even three times. More work, but nobody can deny it makes a fine product. Now, you make sure to save the heads and tails from each of these distillations. These, you’ll add back to the kettle when you make your next run: The feints from the previous first distillation go back into the new wash, and those from the previous distillation #2 go back into new distillate #1 and so both get run through again. Each time you do a run, you save the feints for re-distillation, and nothing gets wasted. Note here that I’m not talking about the foreshot. This is always discarded. Take about 15ml (1/2 oz.) foreshot for every liter (quart) of product that you expect to come off. Discard it, or use it for antiseptic or solvent. There are probably better charts to be found on the Internet, but this will give you a good approximation. Ok, question from a newbie here. I’m in the middle of my first build. A 20 gallon pot still. I want to include a thumper but I have a few questions on them. First, what is the best thing to use as a thumper? Also, I’ve seen photos of them and they look sealed so how the heck do you clean them out after use? I’ve seen wood barrels, old stainless beer kegs, home-built copper ones, glass carbory’s, etc. Any recommendations for a thumper for a 20 gal pot still would be appreciated. GREAT site and GREAT tips from everyone. Let me first come clean on something, so there’s no misunderstanding. The two stills I’ve built were a reflux column still and a gin-basket spirt still. I’ve never actually built or used a thumper keg, and my knowledge on the subject is entirely theoretical, rather than practical, based on my scientific training and extensive reading on the subject. That aside, lets consider the requirements. A 20-gallon pot still is typically going to produce a maximum of 2 gallons of alcohol (perhaps more if the proof is low). That means you need a 4-5 gallon thumper – about twice the volume of the expected output. Five-gallon containers are easy enough to come by, but these need to be heat-, and water-proof and not leak under mild pressure. Beyond that, some measure should be taken to prevent excessive heat loss, so you don’t get everything condensing in the thumper and going no further. In this regard, the natural insulating properties of a wooden barrel is traditional, but I’d suggest that a metal container of some kind, wrapped in insulation, is probably both easier to come by and easier to maintain. Cleaning, as such, should not normally be an issue. Nothing should be getting into the thumper but the water and any feints you put in it, and the liquid that condenses inside. You should never get mash boiling over into the thumper, assuming things go normally. All that should be necessary after a run is to drain the liquid that has collected, and rinse the inside with pure water two or three times.